See combos in table below. 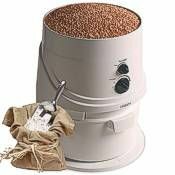 The Family Grain Mill offers multi-grain milling and exceptional versatility. 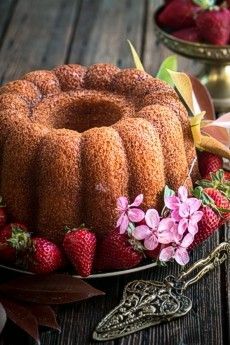 Its grind is infinitely adjustable, from fine for bread flour, to medium for "Cream Of Wheat" style cereals, or coarse for steel cut or cracked grain. It will also mill some chopped, dry, non-oily herbs and spices. 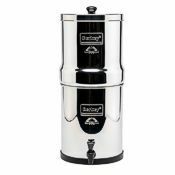 The Family Grain Mill grinds cool to preserve nutrients, and has a large five cup hopper capacity. 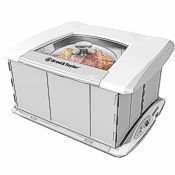 The German-built Family Grain Mill is a modular system, giving you drive choices of electric power or available hand crank option. Any combo can be ordered from the drop-down menu at the top of this page, and the combo table (on this page, below) shows which components each combo includes. The hand crank base can also be purchased lower on this page. In addition to the grain milling head, several other components expand the abilities of the FGM system. 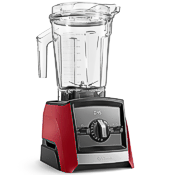 The Food Processor slices and shreds vegetables, nuts, fruits and cheese with interchangeable stainless steel drums. 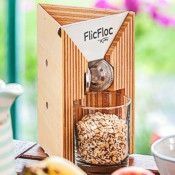 The Flaker Mill head flakes soft grains and is popular for fresh homemade oatmeal, making a hearty flake from oat groats (oats with the hulls removed) that's thicker and chewier than store-bought flaked oats. You can see an interior image and more details on the flaker mill attachment here. 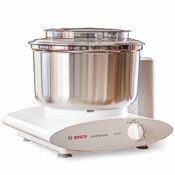 The Food & Meat Grinder is available with a variety of disk sizes, to grind and mince almost any type of food you can think of. Use the electric or hand drive, or drive adapters that fit many leading stand mixers. Processing components include flour mill, grain flaker, food processor and meat/food grinder. 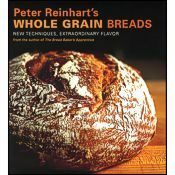 The Grain Mill head grinds soft or hard wheat, oat groats (dehulled oats), rice, triticale, kamut, spelt, dent (field) corn, dried sweet corn, split peas, buckwheat, barley, rye, millet, teff, quinoa, amaranth, sorghum, dry beans, lentils, chopped chestnuts, soybeans, flax, sesame, coffee, and some herbs and spices. 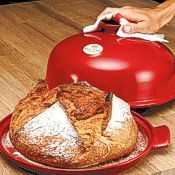 It will also crack grain to any size—you can set the adjustment dial to any consistency from fine flour to meal to cereal grind or cracked grain. It isn't suitable for popcorn, tapioca pearls, or saw palmetto berries. To read more about millable materials, click here. Because it doesn't grind with friction, the FGM's hand crank grain mill base turns easier than most hand operated mills. Overall time and effort are four times less than required by most hand mills, and most mills still won't produce flour as fine. 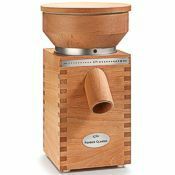 Manufactured in Germany, the Family Grain Mill is built with the durability to provide a lifetime of dependable use. Its body is made of super-tough ABS polymer, and its high-carbon stainless steel burrs are long lasting and easily replaceable. Family Grain Mill components remove quickly for cleaning. 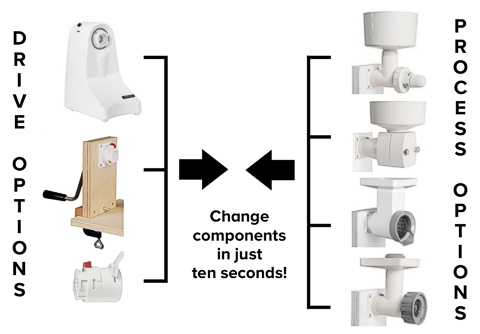 The grain mill head disassembles completely in five seconds, so it's quick and easy to have your mill ready for its next use. And where many mills create a cloud of flour dust to settle everywhere, the FGM operates dust-free. 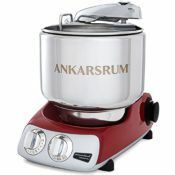 The motor base is free-standing in use, while the hand base clamps quickly and securely onto a table or counter edge, without marring. 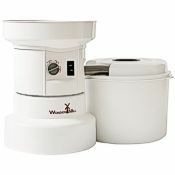 The modular design of the Family Grain Mill lets it store compactly. The motor base is rated at 150 watts. It turns at a loaded speed of 120 RPM, and runs quietly. Pleasant Hill Grain is the world's largest seller of the Family Grain Mill. 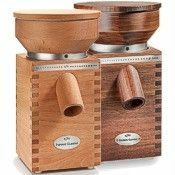 We want you to find the grain mill that best suits your needs, and for many of our customers, the Family Grain Mill is the perfect tool. If you'd like to discuss anything milling-related, call or e-mail us. We'd love to visit with you! Combos below include the product below marked with a green checkmark. Please order at the top of this page. Sale $159.50 $169.00 Yes free! Sale $249.00 $258.50 Yes free! Sale $338.50 $348.00 Yes free! Sale $428.00 $437.50 Yes free! Sale $259.50 $269.00 Yes free! Sale $339.00 $348.50 Yes free! Sale $349.00 $358.50 Yes free! Sale $428.50 $438.00 Yes free! Sale $518.00 $527.50 Yes free! Sale $607.50 $617.00 Yes free! 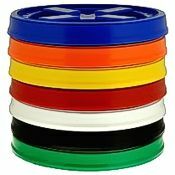 Click to see our grain flakers comparison table. I'd rather spend a few dollars more the first time, than end up spending more in the long run and have to put up with a lot of problems along the way. The Family Grain mill I bought is a joy to use and makes great flour with no dust. Every mill I've been around makes a pretty good growling noise, that's just the grain being broken up into tiny bits. But this one is significantly quieter than others I've been around. The FG mill is precisely manufactured, has proven to be tough, and it puts away easily. Plus I can replace the burrs when they eventually wear down. Not every mill allows you to do that. 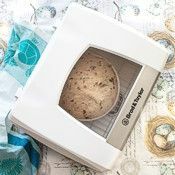 "Great for Gluten Free Baking, Tempeh & Soy Milk Making"
Enjoy milling my own flour. I've experimented with a variety of gluten free nuts and beans. Great product and very easy to use and clean. 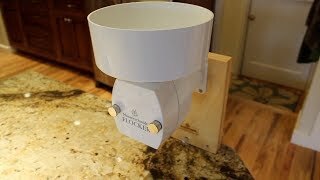 I bought the Family Grain Mill mostly for the flaker (and it's great for that) but making our own whole grain flour with the grinder attachment has turned out to be the most valuable part of the system for our family. 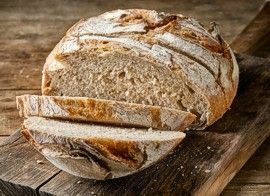 The flour is perfect for bread making, our loaves rise high and the texture has been delightful. Another nice plus is that the parts are very compact so they store super easy. 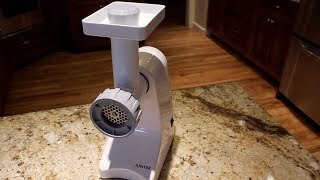 Even if you get just a couple of the attachments, this mill is a great value for the money. The ability to add more functions is icing on the cake. Ease of use, results, it's all good. This is my second purchase of a Family Grain Mill. I bought the other one about 8 years ago, and replaced the burrs 3 times. I use it about 2-4 times per week. 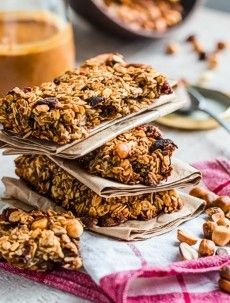 I like the flaker option, and have been making my own granola. I also like the hand-crank option, and have used it 4-5 times when we were camping, or when the power was out. It is easy to use, and not too tiring. The motor is a bit too loud, and I wish it had a finer grind, but overall, it is the best mill for my needs. We got the hand base combo that was available with the mill and flaker attachments as well as the adapter to use on our Kitchen Aid mixer. Works wonders. Tried with the hand base just to test and was fast and easy. We use on the Kitchen Aid normally. I have used this mill mostly to make spelt flour (occasionally coffee beans). It works well; I can set it up and leave it to grind. It does get a bit covered in flour dust during use. It is SOOO easy to take apart and clean. I have enjoyed grinding wheat berries with this mill. 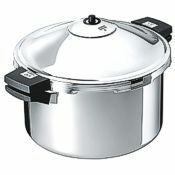 It has other attachments that increase its versatility in the kitchen. The only reason(s) I didn't give it an excellent rating are as follows. I was surprised at how flimsy the electrical cord is. Even though I haven't had a problem at all, the cord doesn't have a heavy duty quality to it, or a thick commercial type of covering in the event a knife falls on it (stored below the knife wall). 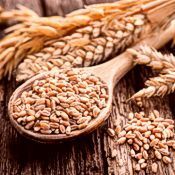 The little marks indicating the fine- or coarseness of the grain are confusing. It is difficult to tell exactly what the degree of fineness will actually be. Also, the grain if I grind a lot warms up. While that hasn't been a problem for me, my subsequent research shows that is an issue for many serious bakers. I do not use it frequently. I am more of an occasional baker. All in all, I am happy with this mill. This is my first mill so I have lots of experimenting to do, but so far I have no real complaints. I really like the fact that I can now grind my own flours for my homemade bread and make my own grain flakes with the flaker. I am having a good time seeing all it can do. It will more than pay for itself in no time at all.